There are more than 11,000 of them. Carefully organized and pasted into large folio scrapbooks, they are copies of letters written by Wisconsin soldiers and published in newspapers throughout the state. Edwin B.Quiner collected them for use as reference materials for his magisterial military history of the state's role in the Civil War. Then, in 1867, he donated them to the Wisconsin Historical Society and, over the years, they have been quoted in scores of books and articles. They presented John Zimm with the daunting task of making "selections I thought would give the clearest snapshot of the part played by Wisconsin's men and women in the variety of situations and challenges they faced." 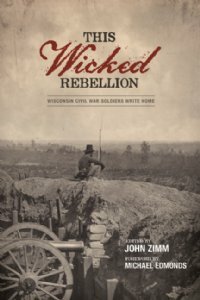 The letters reproduced in This Wicked Rebellion: Wisconsin Civil War Soldiers Write Home show that Zimm has succeeded admirably. The letters are eloquently written and contain a treasure trove of information. The letters are organized categorically rather than chronologically, thus enabling the reader to become immersed in the experiences of the soldiers in various situations. For instance, a soldier camped along the upper Potomac River declares "This is a great country to stay in." He recounts days spent berry picking, foraging, playing poker, and "calling on the country belles..." But a member of the 8th Wisconsin stationed in northern Mississippi complains "of lizards, snakes, and varmints by the million..."
A member of the 8th Wisconsin at Hamburg TN in April 1862 gives a graphic description of his camp after the Battle of Shiloh. "All I can say is the ground we cover extends 13 miles in length," he wrote, "and three miles in width, all one entire camp, and the river is lined with transports, for miles each way, loaded with troops." As a veteran, he knowingly reports that "Men get lost in the camps, and it is almost impossible to find the way back, if one goes far from home." The routine of camp life is relieved by picket duty. A soldier identified only as "Stew" writes from Camp Griffin, VA in the dramatic style to, perhaps, impress the paper's editor. Beyond the picket reserve, he writes, is "the dark woods. I know every every track here; many a long hour have I spent on those bleak hills. Many a time have I traced those winding paths in storm and darkness." Wisconsin soldiers served in all theaters of the war. The letters Zimm has selected describing their experiences on the battlefield are searing in their intensity and heartbreaking in their candor. Writing a week after Shiloh, Sgt. Calvin Morely of the 18th Wisconsin recalls "In a field fronting the peach orchard...a variety of bullets might have been gathered...as they were lying about on the ground like fruit from a heavily leaden tree after a storm." A letter from Arthur MacArthur, father of General Douglas MacArthur, written after the capture of Missionary Ridge, emphasizes the glorious feeling of battle that most soldiers had lost by 1864. "I immediately took the colors and carried them the balance of the way," he wrote to his own father, "and had the honor of planting the colors of the old 24th Wis., on the top of Mission Ridge, immediately in front of Bragg's old headquarters." With an ego he clearly passed on to his son, MacArthur boasted that he "showed the old flag to Gen. Sheridan immediately upon his arrival upon the top of the ridge." Some of the most telling letters Zimm selects reveal the feelings of Wisconsin soldiers when they encounter African Americans and confront the realities of slavery and emancipation. After seeing the "peculiar institution" for himself, a letter writer from Leavenworth, KS in early 1862 admits that "never yet have I found one contented, and never yet seen one that was loyal to his master; and the stories of their careless happiness are forgeries, I firmly believe." A soldier camped near Lake Providence in Louisiana opined that arming former slaves is "a great thing, and will be a great lever in helping to crush this rebellion." But S.R. Knowles, writing from a hospital ward in Newport News, VA spoke for many in 1862 when he declared "I have not seen a soldier, officer or private, but despises them and wishes them off the continent." After walking across the Prairie Grove battlefield, Sidney H. Nichols expressed the sentiments of many when he asked "When will peace, a peace satisfactory to us, overshadow our country..." Taken together, these letters paint an intimate picture of the 80,000 men from Wisconsin who went to war and of the 11,000 who never returned home. They speak eloquently to us of a time when uncommon valor became a common virtue.